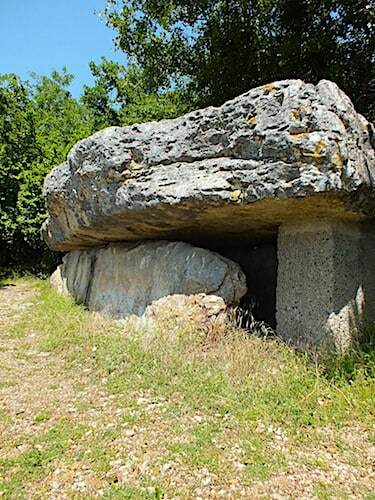 The Dolmen of Pierre Martine is the largest dolmen of Quercy. It indeed boasts impressive dimensions: 7.10m long and 2.30m wide; its support slabs are 4m and 5m wide and 1m high and its closing slab 1.30m wide and 0.50m high. The whole structure weighs 22 tons! Located on the hills overlooking the municipality of Livernon, it’s also one of the few local dolmens that benefits from an official road signage. However, it’s only accessible on foot, but a dedicated car park is available to visitors. 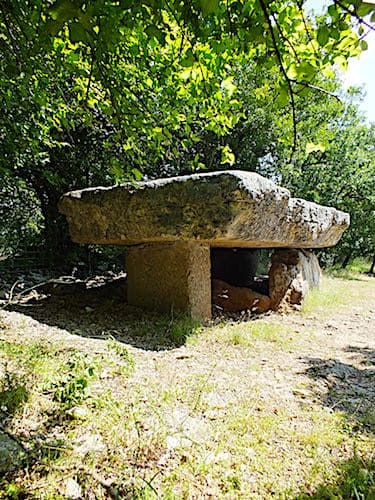 The Dolmen de la Pierre Martine stands 300m farther along, in a clearing and at the end a track that runs among juniper trees and dwarf oaks. The dolmen remained intact for millennia; however, the subsidence that took place over time destabilised its cover slab, which people could easily swing with a simple pressure of the hand. This 'floating' slab gave rise to a legend in the early Middle-Ages. Locals indeed believed that devils came from all over the region and gathered on the slab during the Sabbath and full moon nights. However, St. Martin’s prayers put an end to these diabolic rituals! The patron saint of France (he evangelized our pagan ancestors!) indeed implored St. Eutrope (another holy evangelizer) who triggered a shower of holy water that drove the devils back to hell, where they belonged! The cover slab eventually split in 1948. Concrete props were put in place, years later, in 1966, to consolidate the dolmen and avoid accidents. Archaeologists discovered that the Neolithic folks who erected this dolmen extracted the stone from the limestone quarry located 200m farther down the hill. The limestone strata of this quarry naturally split into almost perfect rectangles, which eased off the work of these distant dolmen builders. Numerous slabs, cut and abandoned, still lie in this Neolithic quarry, which undoubtedly provided the stones of the region’s many dolmens. The dolmen de la Pierre Martine was classified Historical Monument in 1889. N.B. 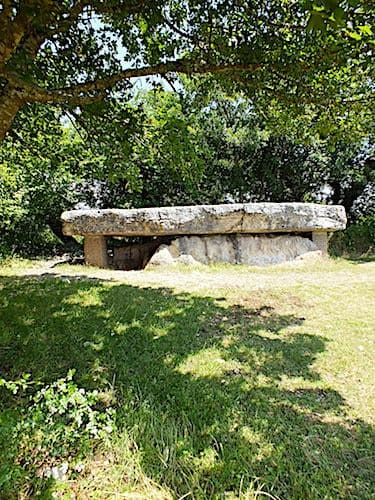 You'll find another beautiful dolmen, the Dolmen de la Rougié 100m farther along; it is 3m long but its cover slab is split in two.